BOTOX has been deemed as a miracle injectable by plastic surgeons and patients alike. When first released, women everywhere were amazed at the results that they never thought could be possible. Although women are still equally as excited about the results from BOTOX, men are hopping on board too. Although it can seem like men are able to get away with a couple additional pounds around their middle and grey hair covering their head way more than women, they still can’t get away with the effects of aging and how it affects their skin. If you’re a middle-aged man, you’ve probably started to notice the appearance of horizontal wrinkles across your forehead, and maybe some subtle wrinkles around your eyes. For some men, the aging process causes them to look perpetually tired, worried, or angry. If you are starting to feel a little self-conscious about the sudden onset of said wrinkles, maybe it’s time to consider BOTOX. BOTOX works by temporarily relaxing facial muscles that cause wrinkles when you contract them so that fine lines and wrinkles are smoothed out. Results are usually seen within a few days with maximum effects occurring in about 10 days. The best part is that there is virtually no down time. You can go back to work the same day. No matter what you might think, BOTOX is still manly. Yes, your girlfriend, wife, sister, or mom might all get it, but they are doing it for a reason — because it works. You don’t have to get so much BOTOX that you start to look like a Ken doll. In fact, your plastic surgeon will work with you to ensure that the results are subtle, yet enough to make a difference at the same time. BOTOX isn’t about competing with the women and men in your life to see who can look younger for longer. However, if the women in your life are looking younger every year and you notice that you’re just looking more haggard — then you might as well join them! If you looked at the most handsome men in Hollywood, you would likely be surprised by how many of them have hopped on the BOTOX wagon. 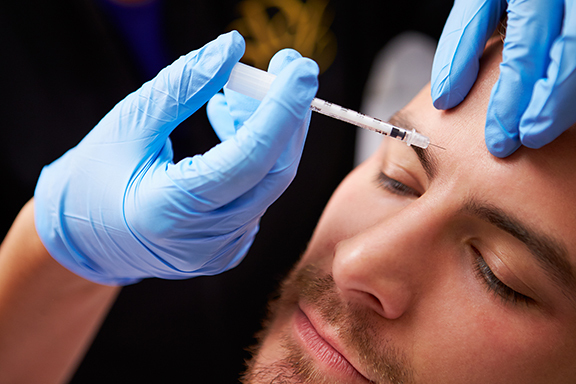 Although typically associated with women, BOTOX can be equally effective for men. Ladies — if you are struggling to find the perfect gift for the man in your life, consider a BOTOX gift certificate. Guys — just hand this article to the woman in your life if they need a hint. The board-certified plastic surgeons at Twin City Plastic Surgery bring you the latest procedures and newest technologies, along with the attentive care and comfort you deserve. For more information on any procedure, you may contact Dr. Laura Randolph — 309-664-6222, Dr. Chad Tattini — 309-664-1007, or Dr. Paige Holt — 309-664-4444 at Twin City Plastic Surgery or www.twincityplasticsurgery.com.